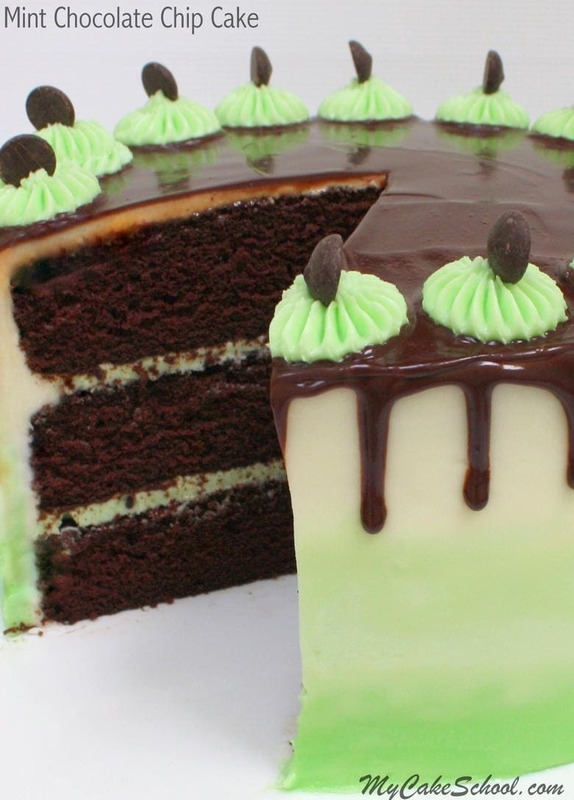 Mint Chocolate Chip Cake is one of my FAVORITE cake recipes. There’s just nothing like the decadent combination of rich chocolate cake with refreshing mint chocolate chip buttercream. Here’s a quick look at how we decorated our chocolate cake with ombre buttercream and ganache! You can find all of the details and links below. One of the key players in this Mint Chocolate Chip Cake is our tried and true Classic Chocolate Cake recipe from scratch. If you’ve never tried our homemade chocolate cake, drop everything and pin or print this recipe! Next up, our cool and flavorful Mint Chocolate Chip Buttercream Frosting. This buttercream tastes JUST like mint chocolate chip ice cream. It could not be simpler to make, and the silky smooth texture is divine. Don’t you just want to grab a spoon? In this cake video tutorial, we also used a quick and easy microwaveable Ganache Drip recipe from our site. This deliciously simple detail that never fails to bring oooohs and ahhhhhhhhs. Love the drama! 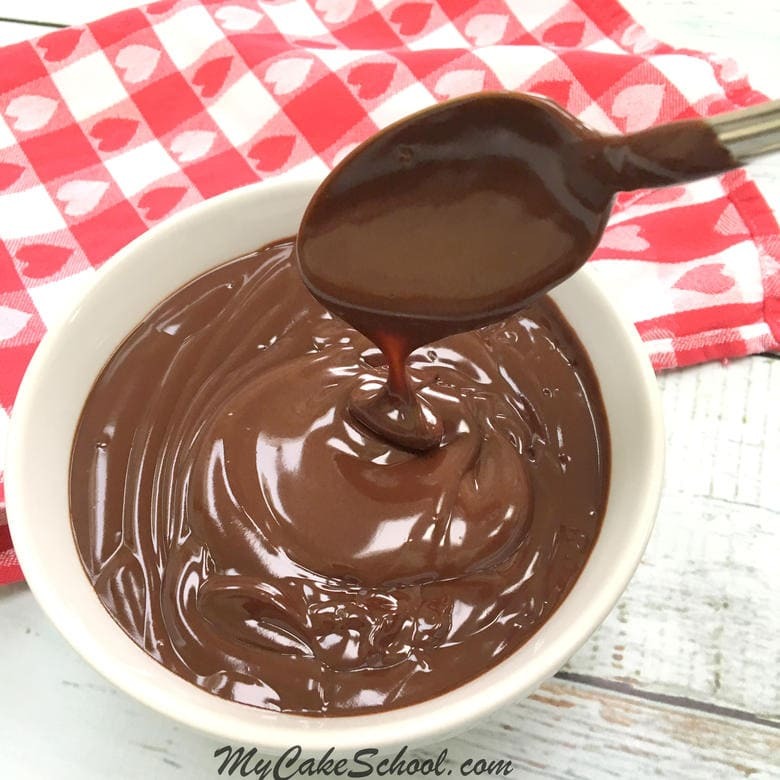 Here is our easy two ingredient ganache recipe: Chocolate Ganache Drip. 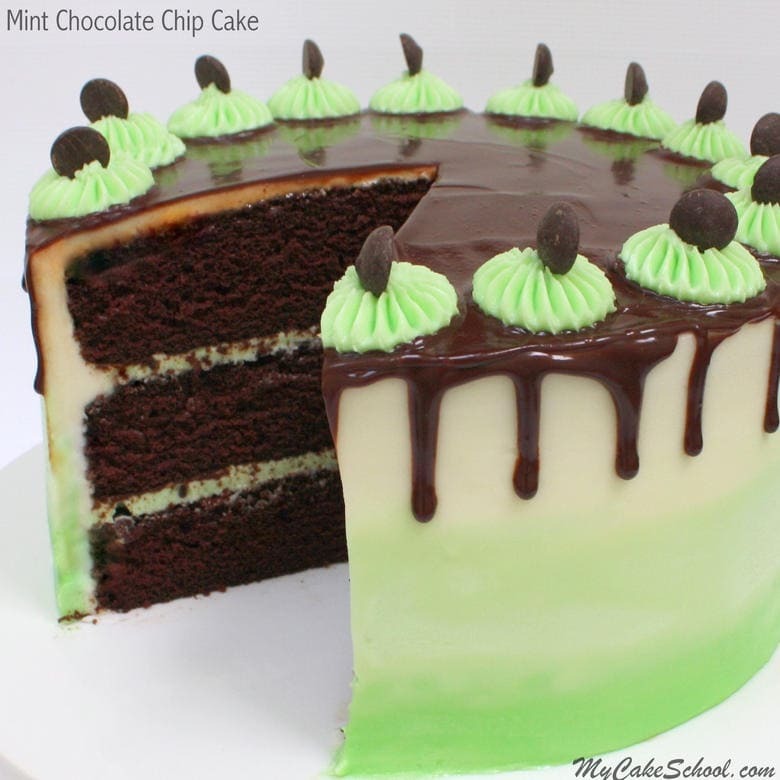 When it comes to decorating Mint Chocolate Chip cake, I’ve made a couple of different versions. In today’s post, I used our Mint Chocolate Chip Buttercream recipe to make a plain Mint Buttercream for the outside of the cake, and used mini chocolate chips for the filling only. This allowed me to give a nice, smooth finish to the outer frosting. We created a trendy ombre design by tinting our mint buttercream with a deep and light shade of mint green using Americolor Mint Green coloring gel. Fancy, fancy! I LOVE the look, and the chocolate drip gives a wonderful contrast. After crumb coating my filled cake layers, I filled disposable piping bags (ends snipped away) with white buttercream, light green buttercream, and dark green buttercream. I spun the cake on the turntable as I piped the sections of tinted buttercream. Then, I smoothed over the frosting with my trusty bench scraper. If you need to make some touch ups (like I did), you can chill the cake in the freezer for about 15 minutes to firm up the frosting and smooth over where necessary with a hot spatula or bench scraper. 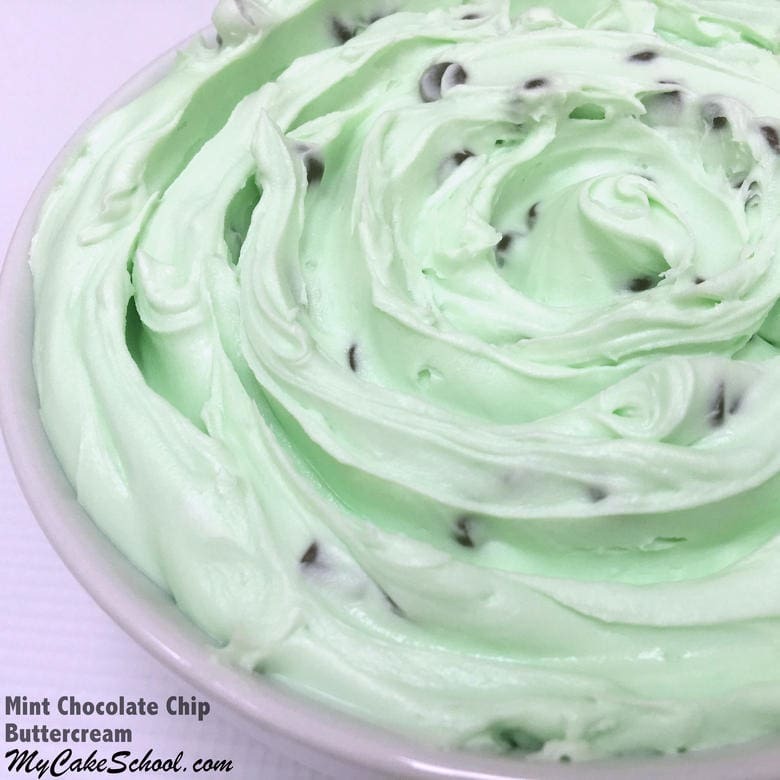 If you’d rather use a Mint Chocolate Chip Cake design that incorporates chocolate frosting, you can just half the mint chocolate chip buttercream recipe and use it for the filling and top of the cake. The sides of the cake could be frosted in our Classic Chocolate Buttercream! You could also change things up and incorporate Andes mints, Junior Mints, or Peppermint Patties into your design. So many options, and all of them are delicious! 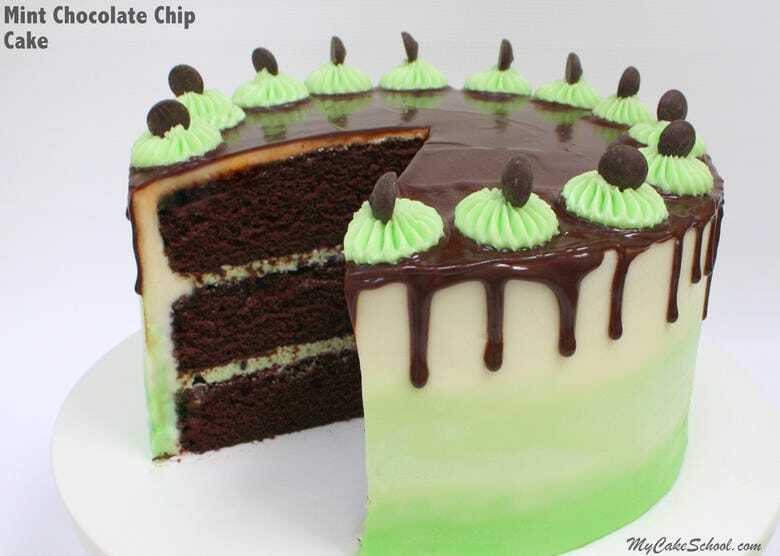 I hope that you enjoy this Mint Chocolate Chip Cake as must as we have! Don’t forget that Mint Chocolate Chip Cupcakes are ALWAYS a good idea! Here’s our Classic Chocolate Cupcake Recipe if you need it! Find our full collection of tried and true cake recipes, frosting recipes, and more in our Recipes Section! Thanks for stopping by! Very pretty! Definitely my favourite combination :-) Love it! Hi Reka, Under the second picture of the cake, click on the Classic Chocolate Cake (in blue type) and you will be taken to the recipe. Do the same for the Mint Chocolate Chip Buttercream (also in blue type). Hi Melissa, thanks for this awesome recipe.It is very unique cake. The mint flavour with chocolate I like the most . It gives different texture to the cake. I made this and just loved it. cake recipe was awesome . I like the Melt cake and loved it. Hi Olga, Our recipe does not have any nuts in it. You can replace the hot coffee with hot water. The coffee enhances the chocolate flavor, but it will still be very good using hot water. The water is hot to help dissolve the cocoa. When you applied the drip, was the cake cold and the ganache warm? Seems like I read somewhere that you need to do this so the drips don’t run all the way to the bottom. Also, what tip did you use on the top of the cake? Thank you. Hi Lea, Yes, the cake is slightly chilled and the ganache only slightly warm. You can test the ganache on the inside of a bowl to get an idea of how fast the drip will run. Melissa used an Ateco 869 tip (French tip). Would the finished cake be ok at room temperature overnight? Hi Pat, The cake would need to be refrigerated overnight because of the ganache. When ready to serve, it should be taken out of the refrigerator an hour or so before serving. The cake can sit out for a few hours, I can’t say a definite numbers of hours because there are so many different climates. This ganache is more perishable than some because it is equal amount of chocolate to cream, which helps to give a nice drip effect. Hi! I tried to watch the tutorial, but is not available anymore. I´d like to know the way to make the ombre design. Thanks a lot! Hi Christina, I’ve updated the format- are you able to see it now? This is a really quick video but you’ll be able to see how we achieved the ombre. We have a longer video tutorial for a rainbow cake- different colors but same idea if you’d like to see! Is the same technique? Thanks a lot. Have a nice evening! Hi Cristina, We used our Classic Chocolate Cake recipe from the recipe section, it uses the reverse creaming method. Melissa has a video of that method of mixing if you are not familiar with it.